Welcome to The Abso!ute Sound online! We explore music and the reproduction of music in the home. We believe that the sound of music, unamplified, occurring in a real space is a philosophic absolute against which we may judge the performance of devices designed to reproduce music. Our goal is to provide the resources consumers need to judge how a component's sound either honors or departs from the music's truth, and to make sound purchasing decisions that maximize their experience of reproduced sound. 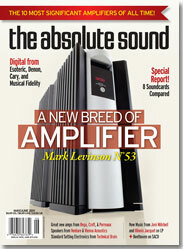 Below is our Issue 213, May/June 2011 table of contents and link to the editorial. Why is mono making such a rousing comeback? Jacob Heilbrunn explores that question with this mid-priced, great-sounding cartridge. Our senior staff picks the ten amps that had the greatest impact on the high end. Paul Seydor listens to this affordable all-tubed preamplifier and tube/transistor hybrid power amplifier pair from England's Croft Acoustics. The long-established brand from New Zealand returns to the U.S. market with this stunning mid-priced integrated. Neil Gader has the details. The new M1 raises the bar in budget DACs, and the V-Link lets you use your non-USB DAC with a computer. Steven Stone reports. Denon's new iPod dock brings PC-less Internet Radio to the party, but does its sound quality stack up? Alan Taffel renders his verdict. Want to turn your iPhone/iPad into a complete audio-testing suite? Steven Stone reports on this remarkable new app. Computer-audio expert Karl Schuster compares eight soundcards that can turn your PC into a music server-priced from $139 to $695. Wayne Garcia listens to this versatile new upper-end disc player from Cary. No product better exemplifies the radically new features of today's digital sources than Esoteric's new player, says Alan Taffel. Neil Gader on this mid-priced treasure from Austria. Rega, the British company known for high value, pulls out all the stops on these ambitious new products. Chris Martens reports. A venerable company surprises the world by using switching technology-with a twist-in its new flagship. Robert Harley puts this technological marvel through its paces. Japanese designer Naoto Kurosawa has built an amp and preamp that set new standards of transparency, neutrality, and resolution, says Jonathan Valin. HP explores the remarkable Magnepan 3.7 in greater depth, and offers his selections and commentary on The Ten Most Significant Amplifiers of All Time. Wayne Garcia profiles seven currently active audiophile vinyl reissue labels: where they're coming from and where they're headed. New releases from The Decemberists, Over the Rhine, Wanda Jackson, Roomful of Blues, Carrie Rodriguez and Ben Kyle, and Donna Hughes, along with rediscovered albums from Joni Mitchell and Michael Chapman. Recent offerings from Chick Corea's Forever and Scott Amendola; improvisations on Giya Kancheli's songbook; and superb vinyl remasterings of Andrew Hill and Illinois Jacquet. Contemporary vocal music from Sandström and Wheeler, new performances of Brahms and Beethoven piano favorites, and two new 45-rpm reissues from ORG. Andrew Quint selects five outstanding "surround" recordings that exploit direct sound from all four corners to achieve greater sonic realism.